This 3-Light Bath Bar, part of the Cabernet Collection, aims to please everyone from the minimalist with its understated design, to the more extravagant tastes with exquisite concept and refined details. Frosted inner glass shade, and classic brushed nickel finish combine beautifully, making this bath bar a functional, yet stylish focal point for any home. The perfect vanity accent, the Dakota line is a masterfully crafted design. A tranquil frosted glass is held in place gently with slim clips. A triangulated backdrop raises the shade slightly to allow light to spill serenely into any setting. 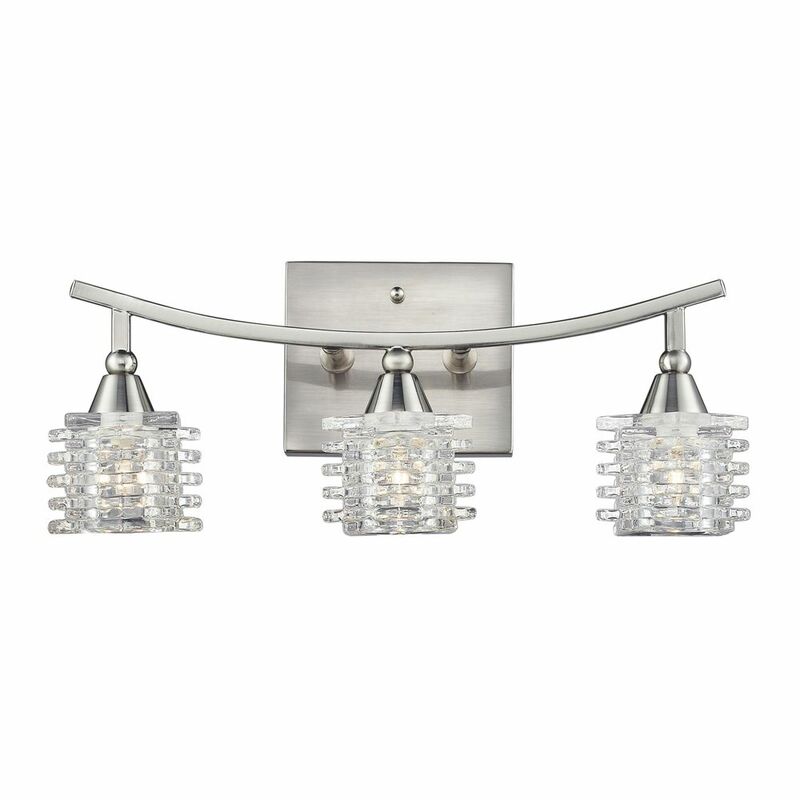 3- Light Wall Mount Satin Nickel Bath Bar This vanity light features an arched bar which is finished in Brushed Nickel. It also features a unique glass diffuser. A distinctive design for any dicor. 3- Light Wall Mount Satin Nickel Bath Bar is rated 5.0 out of 5 by 2. Rated 5 out of 5 by Anonymous from Gorgeous and bright The light illuminates really nicely. It has a warm glow. The glass adds a bit of sparkle. I previously purchased the 4-light version to use in a main bathroom (48" vanity). I liked it so much that I got this 3-light version for the powder bathroom (36" vanity). I wish they made a 5-light version so that I can use in the master bathroom which has a 60" vanity.